I promise that I will blog more about Addie's birthday and her party. It was a great time and I think everyone went home full and happy. We had hot dogs and brats, fresh veggies and dip made with Tofutti sour cream, corn on the cob, deviled eggs, potato salad, chips, and fruit salad. And cake. Lots of Barbie cake. As usual it was all Dairy Free. For now, if you want to hear more about it, you'll have to go to Dana's blog. In a surprise move, Nemo (also called "Memo" by the younger members of the family) has come to live at our house. He is a beautiful red Beta. Some readers may remember that Nemo (of Finding Nemo fame) was trying to escape captivity. However, he seems to have landed in a nice little fish vase at our house. A little jealousy errupted over the ownership of Nemo (I said he belonged to no one but himself, Addie said he was her birthday present and Lily seemed to think that he should belong to her. After all, Addie got all these other cool presents, shouldn't Lily get something?) So Adam played peacekeeper and decided that we would take a family trip to the Wal of Mart. We found a nice little female fish to keep Nemo company. In keeping with the Finding Nemo theme, she was named Dory. Dory is a blue short finned Beta. However, because Beta's tend to be loners and because we don't really want little Dory's and Nemo's floating around, they are in separate vases. Any bets on how long the fish will survive? We met a bunch of friends at a new park on Wednesday night and had a blast! There were 8 kids, 5 mom and 1 dad (yeah Adam!). 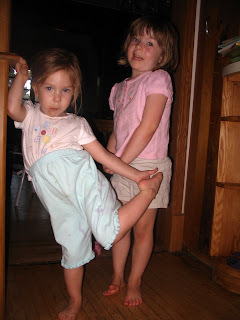 These are mostly friends that Addie and Lily used to go to daycare with so they all get along wonderfully. The kids slip back into playing together like they just saw each other yesterday. This play structure is geared for kids of all ages, with 3 levels you can go up. 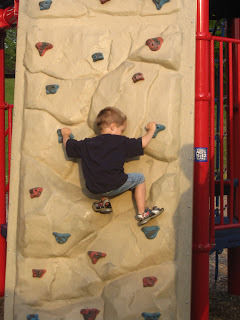 The climbing walls were a huge hit, especially with the boys. This little guy just kept going up the same wall, determined to get to the top all by himself. At the top, he'd turn and look at his mom to make sure she saw his accomplishment. I was pretty impressed! 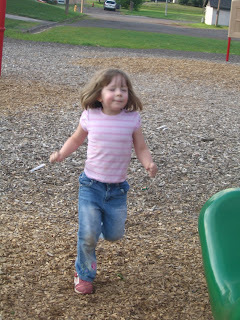 Addie is being chased by a dinosaur, can you tell? 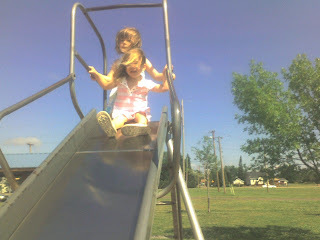 The girls had a blast running around the structure, swinging on the swings and going down the slide. I heard a lot of, "Addie's Mom, there's a dinosaur coming!" When someone asked me if I was worried that Lily was playing on the first rung of this ladder, I said no way. She can never climb up that thing, she's too little. She's barely 24 lbs and she's still in 18 month clothes, she's too little for that. Well she showed me! She climbed all the way up! Over and over and over! 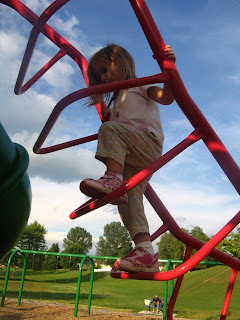 At the top where the ladder starts to flatten out, Lily would be saying, "I not scared. I not scared. I a liddle bit scared." It was so cute to see the look of determination on her face. She *has* to keep up with the big kids. 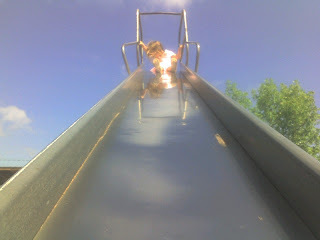 Nothing will stop her from going down the scariest slide or doing anything that the big kids do. 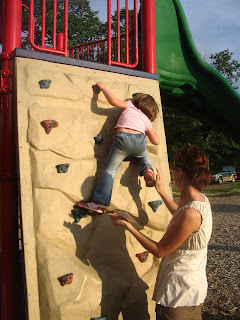 Addie shows off her climbing skills. Addie on the other hand, likes a spotter whenever she does something for the first time. She wants to see her friends do it first and wants to know that there is a Momma at the bottom to catch her. Pete and Repeat walked into a bar. I am living in a Pete and Repeat joke. It just never ends. Even Addie says, "Momma, why Lily always say what I say?" Tonight at dinner Addie tooted. Sure enough, 2 seconds later Lily toots. I swear I'm living with 12 year old boys. 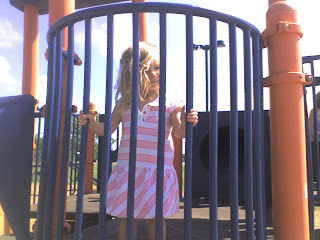 I hope she doesn't get used to being behind bars. I just read this post on Go Dairy Free and I'm a little freaked out by it. I could feel my heart rate going up as I read it. Basically it says that there has been a rise in Milk Allergies in children since farmers began treating their cows with recombinant bovine growth hormone (rBGH). Other countries have banned the hormone, but the US has not. I have heard of children who are allergic to milk having no problem with raw milk from organic farmers who do not administer rBGH to their cows. I've always been scared to even try it. I have an appointment with a naturopath on Thursday and I'm going to chat with her about it. She's by far the most knowledgeable in our community about allergies. She's the one who originally helped me narrow down Lily's allergy to either milk or wheat. Adam took the girls to a new park this weekend. It's a skate park that also has some playground equipment. 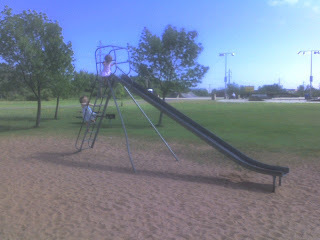 There was the standard new climbing structure, but the hit of the day was the old school metal slide. The girls quickly found out how much faster you go on a metal slide! Lily was a little scared (smart girl!) 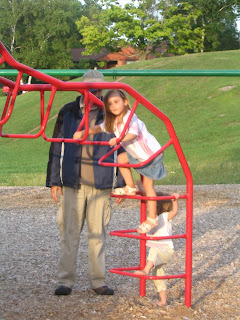 so she asked Daddy to catch her at the bottom. Addie on the other hand liked going fast! She went down so fast that she would have to run once she hit the sand, just so her feet could keep up with the momentum from the top half of her body. I guess this slide is an oldie but goodie. *it wasn't a very hot day - sunny but not super hot - so the girls didn't learn that dresses on a hot metal slide = burns in places I'd rather not think about!! Lily actually did that to herself. I had nothing to do with it. She insisted on getting herself dressed without Mommy's help. 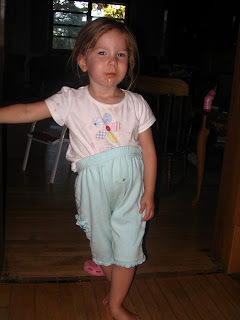 She then insisted on pulling her pants aaallllll the way up. You can tell from that first photo, she's pretty proud of herself. Our friend D loaned us an ice cream maker this summer. 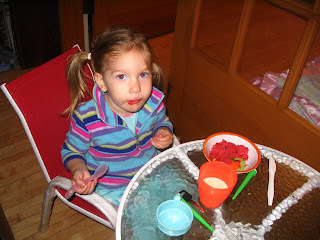 We've been putting it to work - making great sorbets that Lily can eat. 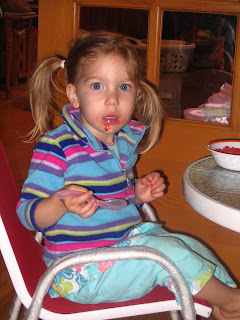 The first thing I made was chocolate sorbet and it was a huge hit. We brought it to a birthday party so Lily and 2 vegan friends would have some ice cream to go with their cake. Mmmm... it was good - very rich. I found the recipe here. 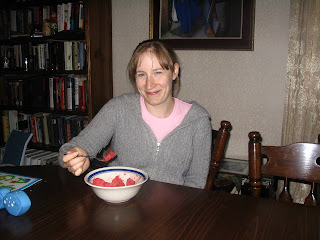 This time I blended up some strawberries and made Strawberry Sorbet. Lily ate all of her bowl and asked for more! You don't need an ice cream maker to make sorbet, my grandma used to make it for me by just stirring the sorbet every 1/2 hour or so until it was all frozen. This breaks up the ice crystals so it is lighter and fluffier instead of being a solid block of ice (like a huge strawberry Popsicle). Thanks D! This spoon's for you! I'm looking forward to making a few more types of dairy-free ice cream this summer. Now that it's getting hot, I'm going to branch out and make a custard type ice cream with eggs and soy milk. I'm sure I'll post reviews and recipes here.